This species is accepted, and its native range is Guinea, Nigeria to W. Cameroon, Ethiopia to Mpumalanga. Shrub or small tree, 0.6–5 m. high. Shrub or small tree, 0.6–5 m. high. Stems ± terete even when young. Stems ± terete even when young. Leaves lanceolate or oblong-elliptic, ranging from 25 × 6 mm. and 30 × 7 mm. to 75 × 23 mm. and 86 × 22 (115 × 37 mm. ), acute or subacute, narrowed to a clasping base, furnished with several pairs of secondary veins and a reticulation of tertiary veins obvious on both surfaces, with a translucent glandular dot within each reticulation, and black submarginal glands. Leaves lanceolate or oblong-elliptic, ranging from 25 x 6 mm. and 30 x 7 mm. to 75 x 23 mm. and 86 x 22 (115 x 37 mm. ), acute or subacute, narrowed to a clasping base, furnished with several pairs of secondary veins and a reticulation of tertiary veins obvious on both surfaces, with a translucent glandular dot within each reticulation, and black submarginal glands. Flowers in few- to many-flowered terminal corymbose cymes. Flowers in few- to many-flowered terminal corymbose cymes. Sepals unequal, ovate to lanceolate, acute to subacute, with black submarginal dots. Sepals unequal, ovate to lanceolate, acute to subacute, with black submarginal dots. Petals (1.2) 2.0–2.5 cm. long, bright yellow with very few or no black marginal dots. Petals (1.2) 2.0–2.5 cm. long, bright yellow with very few or no black marginal dots. Stamens in 5 bundles of about 45 each. Stamens in 5 bundles of about 45 each. Styles 5, usually united up to the apex. Styles 5, usually united up to the apex. In upland dry evergreen forest, moist bamboo thickets, upland evergreen bushland and upland grassland, often by rivers or streams, 1500–2900 m. In upland dry evergreen forest, moist bamboo thickets, upland evergreen bushland and upland grassland, often by rivers or streams, 1500–2900 m.
Shrub or small tree 0·6–5 m. high. Young stems terete, older ones becoming woody, sometimes ± flattened near the inflorescence. Leaves sessile; lamina (25) 30–80 (115) × (6) 10–25 (30) mm., lanceolate or oblong-elliptic, acute or subacute at the apex, narrowed to a clasping base, with several pairs of secondary veins and a reticulation of tertiary veins visible on both surfaces, with translucent glandular dots (or dashes in the uppermost leaves) between the veins, and dark marginal dots. Flowers in few- to many-flowered terminal corymbose cymes. Sepals ovate (more rarely ± lanceolate), acute or obtuse, with marginal (sessile or fringing) dark glands and submarginal dots or streaks. 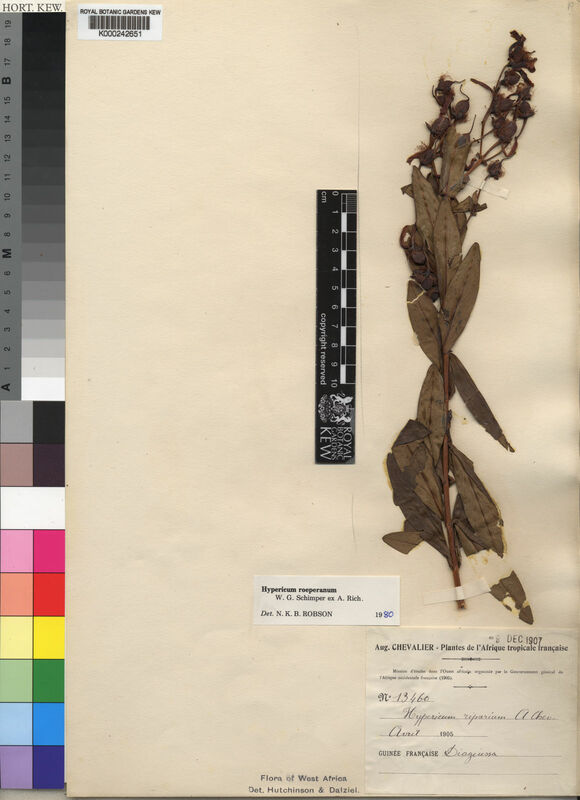 Petals (1·2) 2–2·5 (3·5) cm. long, about 5 times as long as the sepals, bright yellow, usually with a varying number of dark marginal dots (often few). Androecium of 5 stamen fascicles each with c. 45 stamens. Ovary 5-locular; styles 5, united ± to the apex, 9–11 mm. long. Shrub to 10 ft. high. Killick & Robson in Flora of Southern Africa 22: 16 (1976). A.D.Q. Agnew, Upland Kenya Wild Flowers p. 186 (1974). Bamps in Distr. Pl. Afr. 3, map 75 (1971). Moggi & Pisacchi in Webbia, 22: 244, fig. 2, map 2 (1967), pro parte excl. subsp. gnidiifolium. Spirlet, Guttif., Contr. Fl. Congo: 8 (1966). N. Robson in Flora Zambesiaca 1: 380 (1961). Milne-Redh. in Flora of Tropical East Africa, Hyperic. : 3 (1953). A. Rich., Tent. Fl. Abyss. 1: 96 (1847).